Incredibly spacious - especially for a slimline model, gorgeous modern design, very well constructed, and operates flawlessly May be slightly too large for some kitchens - check the measurements before purchasing. So you're considering buying a new combi microwave, but unsure of which model or manufacturer to plump for? The combination market has an abundance of options, with all of the leading brands wanting a slice of the action, and so initially it can be a pretty overwhelming choice. To help narrow down your options, firstly we'd recommend working out the main features you require from the appliance, in particular the size and capacity. The size refers to the physical measurements of your microwave's exterior - this is particularly vital if you have limited space in your kitchen. The capacity refers to the room available within the microwave, and is usually provided in litres, and is further illustrated by the turntable diameter. Arguably the latter is more important than the former for the vast majority of users, as most kitchens will have room for a large microwave - however it is imperative that you measure before buying to avoid having to deal with returns. In order to determine if a particular model is spacious enough for your needs, measure the widest point of the largest dish you intend to use within the combi microwave, and make sure the turntable will cater for this. So now you'll know the rough size of appliance you need - we can proceed with details on the NN-CT579SBPQ - a mid size slimline microwave with a 34 cm turntable. The slimline aspect of the name refers to the slim nature of this microwave - it's body measures just 52cm by 39.5cm by 31cm, and weighs an impressive 13.5kg. Sound about the right size? In terms of performance, the NN-CT579SBPQ may well be the ideal cooking solution for a busy household, with 1000w of power in microwave and oven mode, and 1300w when using the built in grill. Panasonic are renowned for manufacturing high quality and reliable products, and the NN-CT579SBPQ continues to support this trend, with an incredibly well built body - it's solid to the touch. The controls are simplicity itself to operate, with a series of well labelled buttons and overall our testers were very impressed with the build quality and user friendliness. Each function is clearly defined, and we didn't need to consult the manual at all, which for us is a breath of fresh air! Power output is pretty good - 1000w in microwave mode, the same in convection oven mode and 1300w in grill mode and, unlike some cheaper models, all of which can be used in combinations to compliment each other. Six different power levels are included, as are the usual child safety locks, built in timer, and a handy weight sensor. Enough about the specification - how well does it work? In short, the NN-CT579SBPQ cooked beautifully - with food coming out perfectly cooked - our testers were very impressed with the performance of this model. We tested several different dishes, from basic reheating of meals to roasting meat joints, and all came out looking and tasting delicious. Cleaning afterwards was pretty simple too - a quick wipe of the stainless interior and it looked good as new. It seems that you do indeed get what you pay for - If you're after a versatile and high performing combi microwave, then the NN-CT579SBPQ is well worth the money. It may be quite an investment, but our test team were unanimous in believing that it is worth every penny. The Panasonic NN-CT579SBPQ is an incredibly well designed combi microwave - finished in a sleek silver exterior, it is both well built and looks stunning. Our testers loved it - it cooked food to a very high standard, is a piece of cake to use and takes no effort to clean. If you need a large combi microwave, then the NN-CT579SBPQ should definitely be on your shortlist. 34cm diameter rotating removable turntable. Inverter system included for fast and effective cooking. can you use metallic utensil? As with all microwaves, we’d avoid using metal utensils inside the microwave, as they can cause it to malfunction and possibly break. 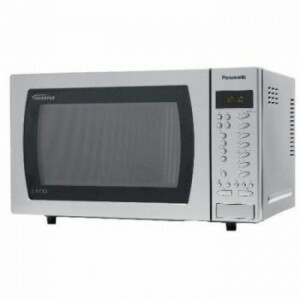 I’m seriously considering buying one of these models having had an ordinary Panasonic microwave for 20 years now! As I am only cooking for myself these days,is there any advantage to having one of these as opposed to using my conventional electric fan assisted oven???? or is it best to keep to the tried and test conventional microwave??? Some reviews I have read don’t rate this model very well or is that just bad luck??? Another thing you keep calling the colour silver – or is it stainless steel on the exterior??? Can this convection microwave oven be built into kitchen units? We would like to buy this microvave and take it with us to another country. How do we get the tax back? If we take it with us to another country. How do we get the tax back? I’m afraid I don’t know the answer to this – however if you contact the relevant tax authorities then they should be able to advise you. I have a another variation of this model ie the same power size , capacity and user instructions are the same. I am on the third one in a month due to quality issues albeit arguably minor.These were a broken glass turntable,and a noisy vibrating side panel. The oven is unbeatable for its specification and price.I have cooked/reheated many items successfully including a chicken but I am struggling to cook some others eg a pizza on the auto programming and a frozen strudel. This is due to the location of the heat ie from the top . The tops get burnt. I suspect that might be solved by an intermediate level wire rack and perhaps covering the tops of items when necessary on some convection cooked recipes. Its a challenge and I am hoping to resolve these issues.